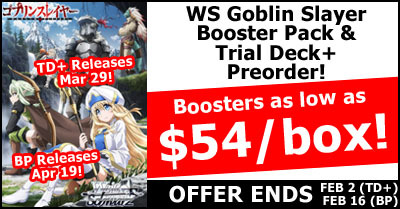 This is a PRE-PAID LIMITED pre-order for the WeiB Schwarz Goblin Slayer Booster and Trial Deck +. Pre-order period for the trial deck + ends at 10 PM on Saturday, February 2nd and the booster ends at 10 PM on Saturday, February 16th. Release date for the trial deck is Friday, March 29, 2019 and booster is Friday, April 19, 2019. Pre-Orders cannot be cancelled. If you order both the trial deck and booster in the same order they will ship together for the booster release date.